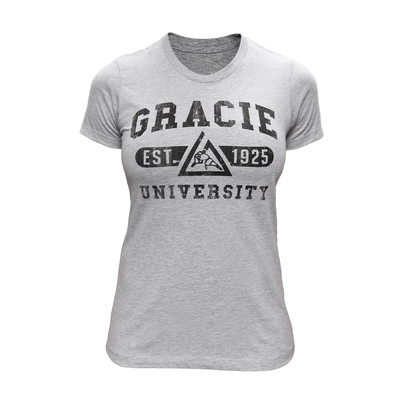 Gracie University Pullover Hoodie has been added successfully to your wishlist. Garment Details: 80/20 cotton, polyester with front & back silk screen prints on a heavyweight pullover hoodie. Ryron's Size: Ryron is 6'4" 190lbs and is wearing an XL. This sweatshirt is excellent quality. It's very thick, generously cut, and it's warm and very comfortable. This was purchased for someone who is 6' and roughly 180lbs, I chose the size Large and it fits perfect, the length and fit it just right. Originally purchases this for my husband but stole it so often that I just purchased one for myself in Medium. I will update my review on how it fits on a woman once I receive it. Overall, amazing sweatshirt and the price point seems right for the quality. I love my gracie hoodie. It's a little pricey but for someone like me who loves jiu-jitsu I didn't mind paying the price just wish it were a little lower in cost. Wish the hoodie came in black with white letters that would be awesome. My sister and daughter both want one now that I have one. great hoodie I live in MO it's 30 outside and I'm warm as can be this is the sh*t! Awesome hoodie! Really like it. Ended up getting it signed by 8th Degree Gracie Jiu-Jitsu Black Belt Master Pedro Sauer (under Helio & Rickson Gracie) at an outstanding seminar of his!